I have been planning to make these since the summer but somehow never quite got round to it. I first saw a recipe in a cook book and thought it looked great but too complex for the level I was at at the time. Then I saw a recipe in Good Food Magazine and that one was easier but still rather time-consuming and difficult. Then I saw Nigella’s ‘Processor Danish Pastry’ in Domestic Goddess. Although, as usual, while the narrative style is better to read it’s a pain to cook from so I sort of went my own way with the method. I still didn’t get round to making the damned things for several months but this one was definitely the easiest of the lot. Time consuming is going to be consistent across all recipes as this does take time. However, you can split the stages up over several days. For example: Make the dough on Friday night, leave it to rise overnight. Do the rolling on Saturday some time. Make the pastries on Sunday. I started the dough at around 10pm on Saturday night and did the rest over the course of the day on Sunday. I totally forgot about the second rise when thinking about my timings so instead of afternoon tea they have become dessert but it’s all good where pastry is concerned! Once you break this down into the separate stages it is actually very simple and only a matter of organisation. 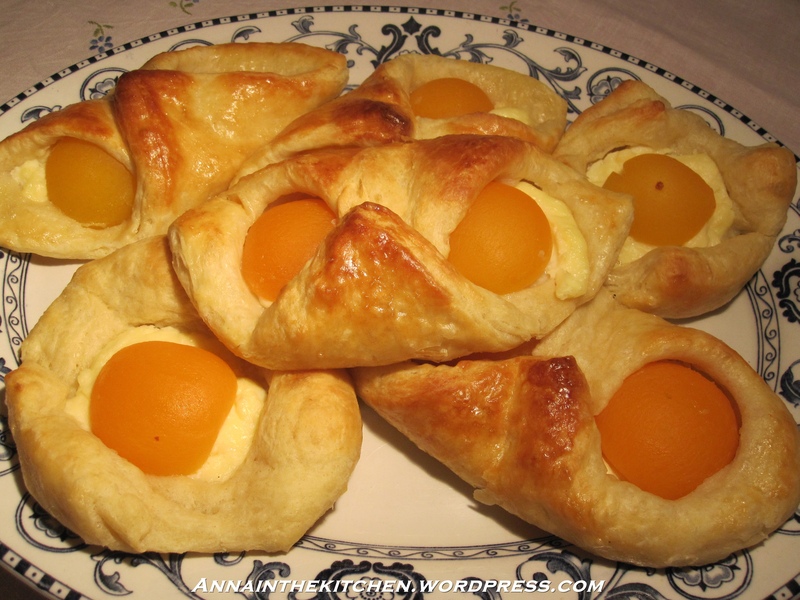 I made Apricot Danish with custard for added squishyness. I love the Apricot Croissant in Cafe Nero so this was the first flavour I wanted to try making. I used Bird’s instant custard powder to make up my custard (having to completely disregard the instructions to get a thick enough custard). I can’t advise doing this to anyone else. May be the ready-made cartons of custard are better but this stuff was bland and boring. May be adding some vanilla essence in there might help but if you can then go all out and make your own! – In a jug mix together the water, milk and egg and beat together. 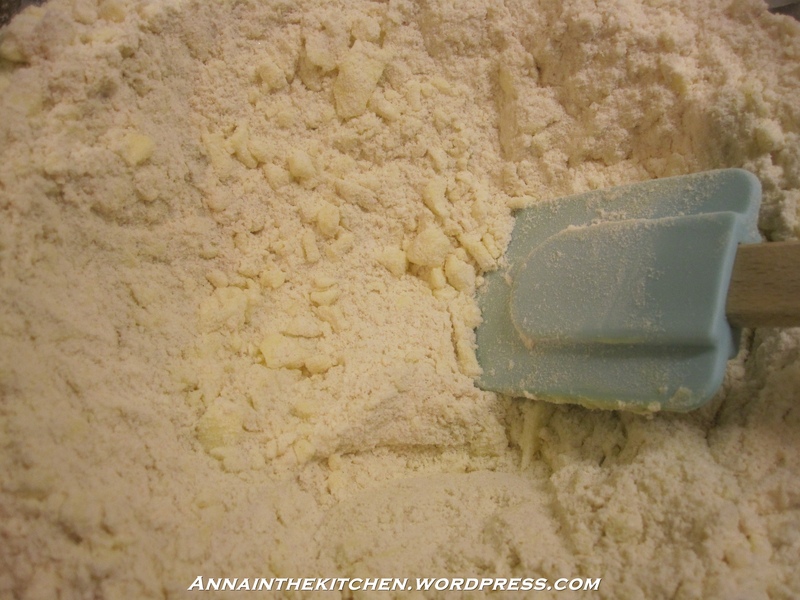 – In a food processor add the flour, yeast, salt and sugar and pulse it once or twice to mix it all together. – Tip the contents of the food processor into a large bowl. – Make a well in the centre and add the liquid ingredients. – Mix together using a spatula, or your hands if you want to get messy, bring the ingredients together until they form a soft, gooey dough. – Cover the bowl with clingfilm and put in the fridge overnight or up to 4 days. – Dust your work surface lightly with flour and tip out the dough. – Roll it out into a rectangle about 50cm on one side. The dough should be under 1cm thick. – Pinch the edges together to seal. – Rotate the dough 90* so that the longest edge is horizontal in front of you. – Stop when you’ve pinched and sealed the edges before rolling it out again. – Cut the rectangle of dough in half. – Wrap each half in cling film and chill for at least 30 minutes but you can leave it in the fridge for up to 4 days if you haven’t left it that long earlier of you can freeze it for later. – Line 2 baking trays with baking paper. – Remove half of the dough from the fridge when you’re ready to work with it. – Lightly dust the work surface with flour and roll it out into a large rectangle. – I found it easiest here to place the square on the tray where I wanted it before adding my fillings as they were rather squishy and it could have got very messy otherwise! 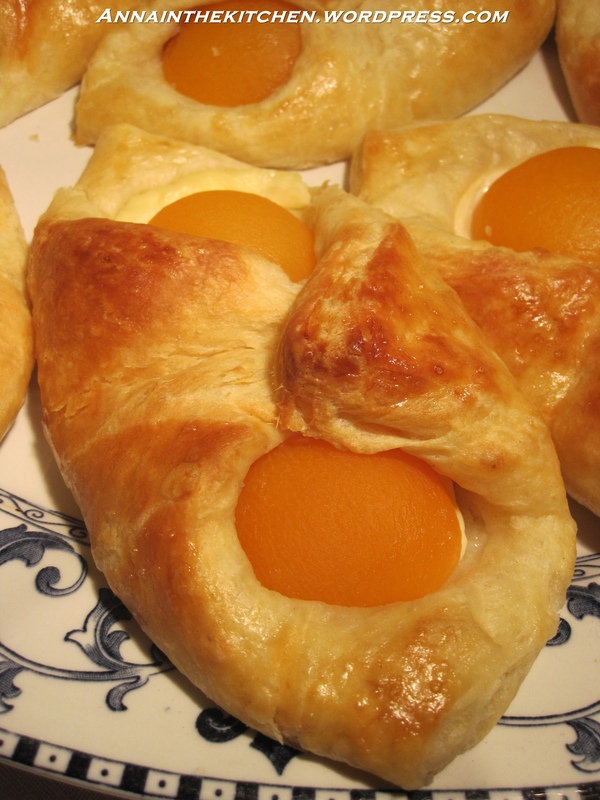 – If making Apricot danish add a spoon or two of thick custard diagonally across the centre of the square then add two apricot halves on top of that. – Fold over the edges and pinch gently to seal. – Brush with the beaten egg and leave to rise for about an hour until puffy and soft. – Heat the oven to gas mark 4. – Once the danish have risen put them in the oven and bake for 15 minutes until puffy and golden brown. – Take the trays from the oven and leave until they’re cool enough to handle. – Once cool you can glaze them with 100g caster sugar and 60ml water mixed together if you like but I didn’t bother. With the custard, does it solidify in the oven? Bottled custard is so liquidy! It does solidify a bit but mine wasn’t particularly runny to begin with. You want a cooked, thickened custard, if it stays on a spoon then you’re on the right track, if it pours then it’s too thin for this.